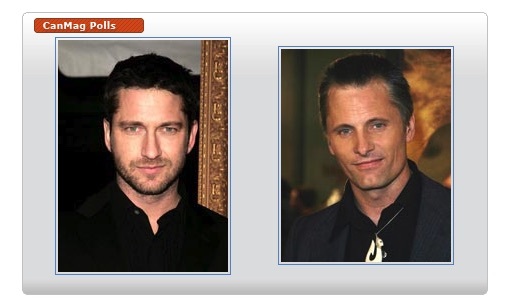 Home • News/Blog • Viggo Mortensen or Gerard Butler? After naming Viggo Mortensen as their readers’ Favorite Actor or Actress, CanMag got some pushback from fans of Gerard Butler, who came in a close second. So they are having a run-off election. Here’s your chance to vote for your favorite. Right now Viggo is slightly ahead with 52% of the 585,943 votes cast. Update September 2018: the poll is still open, and Gerard Butler is now in the lead, 51% to 49%. It’s not too late to express your opinion!